Indonesia is preparing warships and ferries in case it needs to evacuate children affected by haze caused by the country's forest fires. Co-ordinating Security Minister Luhut Pandjaitan said an evacuation was one contingency among several others. 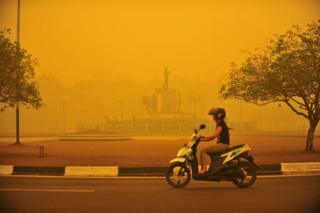 South-East Asia has been particularly hit hard this year by the haze, an annual occurrence. It has caused serious health issues, particularly among those living in the epicentres Kalimantan and Sumatra. Mr Pandjaitan said authorities had identified at least six provinces where children and babies could be evacuated, local media say, but any evacuation would depend on approval from President Joko Widodo. Other options include moving residents to government offices equipped with air purifiers, Reuters news agency reports. Why are peat lands burning? The haze is caused by farmers clearing land for plantations for the palm oil, pulp and paper industries, primarily in the Indonesian province of Kalimantan on Borneo and the island of Sumatra. Residents in those areas have been living with hazardous levels of smoke in the past two months. Indonesia has struggled to put out the fires, most of which are on peat land which burns for longer and produces more smoke than other fires. US-based environmental research organisation World Resource Institute said earlier this week that the daily carbon emissions caused by the fires were surpassing the average emissions by the United States. The haze has blanketed Singapore and Malaysia as well, straining diplomatic ties, and has recently drifted northwards to affect southern Thailand and the Philippines. Video South East Asia haze: Why are peatlands burning in Indonesia?